You may have seen our Harry and Meghan swimsuits when they hit the news earlier in the year, well the swimming costumes are at it again! 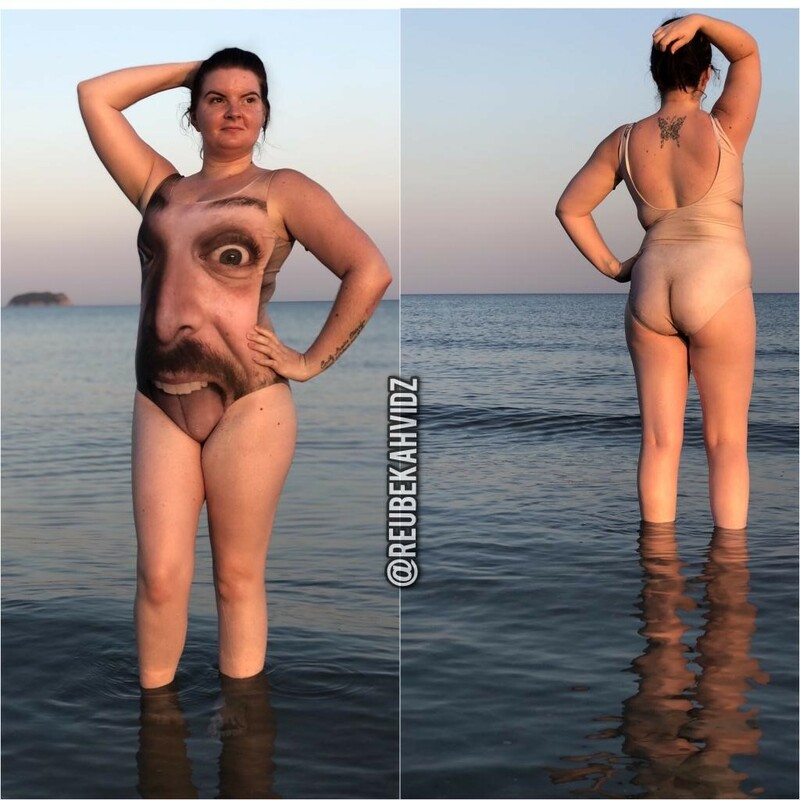 As some of you may have seen, Reubekah Vidz ordered one of our personalised swimsuits for an amazing prank that they were playing on each other. For those of you have haven’t, check out the video below! Rebekah and Reuben are a pair of jokers. They like to have a laugh, and enjoy themselves, both in their relationship and online. They are firm believers of the old saying “Couples who laugh together, stay together” and they certainly know how to laugh together. We loved both Reuben’s creativity and the pure sportsmanship that Bekah showed, not only wearing the costume that was made for her, but modelling it with such pride. We decided to catch up with them and ask them a few questions about themselves and the experience. When did the pranking start? We started creating videos and putting them online about six months into our relationship. We were both very jokey from the beginning, and we both have a similar sense of humour to one another. Did you start before you made the videos and channel, and if so what made you decide to start the channel? Yes, we used to play little tricks on each other before we started recording them. Rebekah loves to make me jump constantly at every opportunity she gets and she’s been like that from the beginning right up until now. We would do silly little things like put salt instead of sugar in each others’ cups of tea (I’ve actually stopped taking sugar in my tea now, although I can’t for the life of me think why?!) We would also hide each others’ things, just so we could laugh at the other one’s reaction when they got wound up having to search for it. It sounds mean but it was all in jest and if they really couldn’t find it we would always tell them where it was….eventually! The first video we ever made was when I recorded Bekah doing her hair and make up and said “I don’t know why it takes girls so long to get ready, she’s taken hours and still looks like s#*t!”. She gave me a slap and then we both laughed. It was recorded on my phone, so I sent it to my sister who found it absolutely hilarious. With that I then decided to post it on Facebook and it did really well in terms of people liking it and sharing it. From there we used to start recording our daily antics and posting them to our personal Facebook accounts and after a couple of months a close friend suggested to us to create a Facebook page where people could watch all our content in one place and go back and re-watch it if they wanted to. So that’s what we did and here we are now. Who reacts better to the pranking? I think it all depends on what it is and what’s been done really. There have been times where the real reaction hasn’t set in until a couple of hours, sometimes days later i.e when I slapped a wax strip over Reuben’s eyebrow and whilst ripping it off took half of Reuben’s eyebrow with it! Reuben was shocked at first but then the realisation of him having to go about his everyday life with just half an eyebrow and having people constantly asking “what happened to your eyebrow?” only sunk in after the prank. We both have different reactions, so I don’t think either of us react better than the other. There have been times where both of us thought the other one would get super annoyed but then once it’s done they have actually gone completely the other way and just laughed it off. I think it depends on what’s been done, and what mood the person is in on that day. Does the constant practical joking strain you at all? Have you gotten to the point where you feel like everything might be a joke? Yes, we do tend to question each other a lot of the time and if the other person is being suspiciously nice we are like “What are you up to?” We are forever asking each other if we’re joking or being serious because you just never know. We used to prank each other a lot more than we do now and that’s purely down to the fact we catch each other out a lot more and I think that’s because when you have been doing it everyday for the last few years you tend to know something may be around the corner, for example whenever we see a camera out then something is about to go down, or has already happened. I saw in one of your videos that you have a daughter, how does she react to it? Is she team Reuben or team Bekah? Bekah has a daughter and a son, they love the videos and think they’re hilarious, they even try and prank us at home by making us jump, or hiding things in our shoes, or even hiding the shoes altogether. Unfortunately they are both Team Bekah, however they do help me out in pranking Bekah when I need it. Rebekah saw someone on the beach posing for pictures, and thought she looked absolutely ridiculous, so decided to mimic her! When Reuben placed his order, we didn’t know we were catering to an internet superstar! As he had the exact same treatment as every customer would have received, we just had to ask him a few questions about how he found us, and what he thought. How did you come up with the idea for the prank? We had planned to go abroad and Bekah kept going on about getting a new costume and bikinis to take, I was planning to initially sabotage them, possibly even break them all so she couldn’t then wear them but I thought that was a tad mean, so I searched online for some different styles of costumes to see what I could find, and your personalised costume popped up, and it was perfect. How did you come across our site, and what made you choose it for this costume? I came across your website by searching on Google, and your website popped up. Your website was easy to use, and easy to design and the quality of them looked good. The turn around time was fast and what I needed as I only had a few days until we went on holiday, I also loved the fact they’re hand stitched and have a warranty on them. I had an all round good vibe about your site, compared to others I looked at. How did you find the product itself? I’m not going to lie I did initially think the price was a little steep with postage, however you get what you pay for and I certainly did in this instance. I feel (obviously if it didn’t have my face and bum on) the costume would last for many many uses, it fit perfect too as to your size guide. Would you use our site again, or recommend it? Yes I would definitely recommend, and use your website again if I was ever in need to. Rebekah finally managed to relax in the swimsuit, but from behind it was a bit of a “full moon” view. We loved the sportsmanship (or sportswomanship) that Rebekah showed by wearing the costume to the beach. We asked her a couple of questions about the whole experience. On a scale of one to ten, how mad were you?! Initially 10!! I had just brought myself new bikinis and a new costume, so I was super mad he had left them all at home as I was eager to wear them on holiday. After I had tried the costume on, I could kind of see the funny side to it, as the costume did look quite funny on, so although I was still annoyed it was somewhat funny and the fact that he had got me good! Excluding the stares you got, was the costume comfortable to wear, well made and well sized? LOL! The amount of stares I got was ridiculous, it was so embarrassing! The costume was comfy and fit perfect. I don’t like the high arched hip costumes or too low on the front, but it fit lovely, the only downside was the internal meshing did come out around the bum and straps so I had to keep poking those back in, but other than that it was comfy to wear. No.. I don’t think I would ever wear it again, in fact I’ve hidden it, so Reuben couldn’t pack it again when we went away with the children on holiday shorty afterwards. Did you get other swimsuits/bikini’s while you were there, or did you exclusively wear that one? No, I did have a look around the shops but couldn’t find one I liked, so I bit the bullet and wore the one Reuben had packed. Reuben being the b*$#**r (polite way of putting it!) did reveal towards the end of the holiday that he did pack one of the costumes but of course he only mentioned it when I had already wore the one he bought and totally embarrassed myself! He had packed my one in his case, so I did go to the beach once without being stared at! Are you planning a suitable revenge? 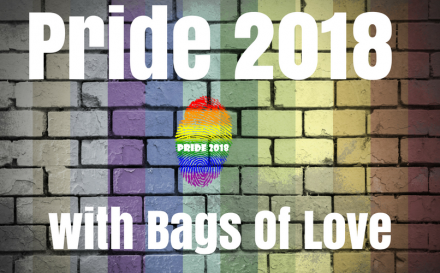 We would like to offer a huge thanks to both Reuben and Rebekah for taking time out to speak with us, as well as for their honest opinions and for sharing their story. It was an absolute pleasure speaking with you, and I am looking forward to seeing more of your pranks! If you want to check out more of Reubekah Vidz pranks and challenges, take a look on their channels below. Whether you are looking to play a prank, or just happen to feel inspired, you too can create your own personalised swimsuit. Its really simple to do, so what are you waiting for?